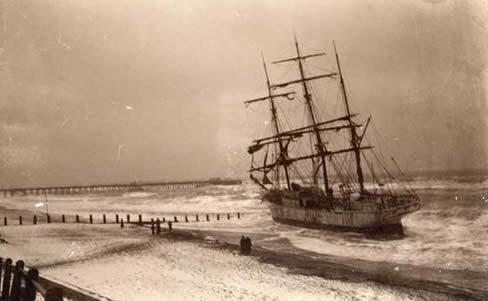 On 17 January 1912 in snowy, stormy weather, the lifeboat, Alfred Corry, went to the rescue of a vessel, (the Voerwaarts) caught on a sandbank off Dunwich. A couple of hours later, the coastguard, at St James’ Green, reported a mysterious light at sea, which turned out to belong to a Norwegian three-masted barque, Idun, (pronounced Iddune) being blown onto the shoals, or sandbanks, a few hundred metres from the beach. The Alfred Corry already being at sea, the crew of the reserve lifeboat Rescue had to drag it half a mile through Southwold’s narrow streets on a trolley with six-foot diameter wheels before launching below the town centre. It would have been impossible to launch it off the beach and get to the stricken vessel because of the storm and the shoals. 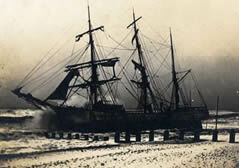 The Idun was, by now, broadside on to the beach, pounded by the heavy seas and in imminent danger of breaking up. Meanwhile, the coastguard’s rocket crew were trying to fire a line out to the stricken ship. 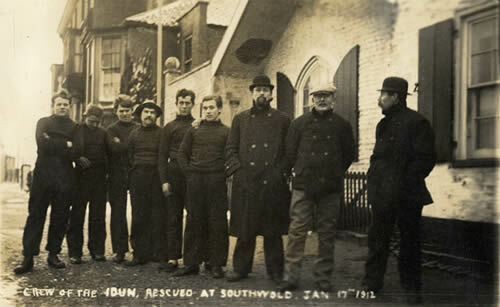 This they managed and rescued all nine crew, one at a time, by using a ‘breeches buoy’ – like a pair of trousers being pulled along a washing line. Indeed, one crewman fell out of the buoy and was rescued by townsfolk who rushed into the sea to grab him before he was swept away. The lifeboat (and remember this was an open boat propelled by oars in a raging sea) failed to get a line aboard the Idun and was carried past it. Sadly, the Idun could not be refloated. 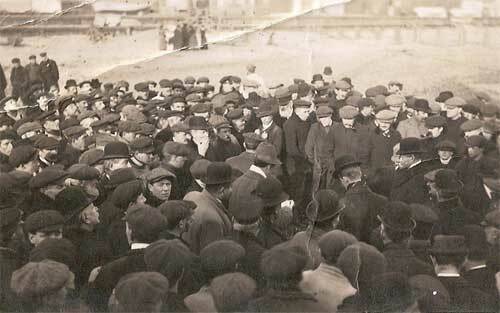 Two weeks after being driven ashore, she was auctioned for £65 and broken up where she lay. The remains seem to have been distributed all over Suffolk. 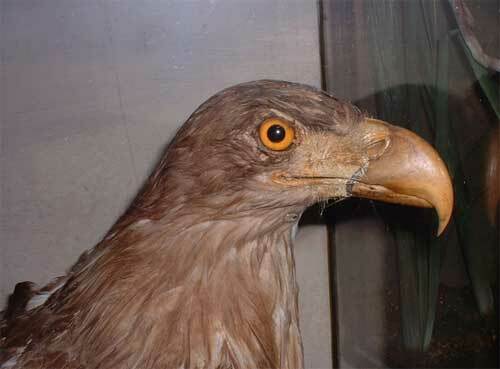 Grocer William Steley of Stradbroke Road bought this fine stuffed eagle which had adorned the captain's cabin. William later donated it to Southwold Museum where it is displayed to this day. There is one enduring mystery. Why was a vessel, which left Antwerp before Christmas, en route to Cadiz, caught in a storm off Southwold one month later ? For more information about Southwold’s wrecks, please see A Chronology of Sole Bay Shipwrecks, available for purchase in the museum or by post. Close this window and click 'Shop' in the links at the top of the page.